Founded in 1750, Cumberland Valley is steeped in history -- from its architectural downtowns to the modern facilities honoring past heroes. 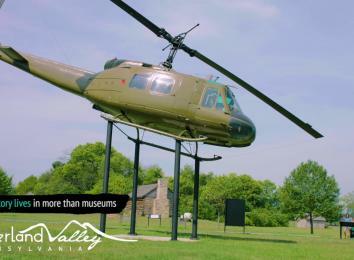 As you explore, you&apos;ll find museums and historical sites where you can interact with the past in new ways and uncover why the Valley is as passionate about history as it is about making it. Organized in 1789, the Union Fire Co. No. 1 in Carlisle is housed in the Victorian fire house they built in 1888. During World War II, the Enola Rail Yards consisted of 217 sets of track that handled more than 10,000 rail cars a day. Mary Ludwig Hays (better known as Molly Pitcher) is renowned for her bravery at the Battle of Monmouth during the Revolutionary War where she assisted her husband at his gun station. Visit her grave and statue at the Old Graveyard in Carlisle on E. South Street. The Carlisle Indian School is where Olympian Jim Thorpe and more than 10,000 American Indian children went to school from 1879-1918. The Locust Grove Cemetery in Shippensburg has been the final resting place of Shippensburg area African-Americans for nearly two hundred years. Among those buried on the cemetery grounds are twenty-six black Civil War veterans who served with the U.S. Colored Troops between 1863 and 1865. Those veterans include men who served with the 54th and 55th Massachusetts Volunteer Regiments, the first combat units open to African-American men during the Civil War, which were the units featured in the movie Glory. During the Confederate invasion through Carlisle from June 27-30, 1863, both West and East Colleges at Dickinson College were used as hospitals for wounded Union soldiers and captured Confederates. Confederates shelled Carlisle during their invasion in 1863. Marks are still visible on the one column at the Old Courthouse. George Washington really did sleep here - for an entire week in October 1794. So did 14,000 militia men. They came to Carlisle to march with Washington to Western Pennsylvania to quell the Whiskey Rebellion. The Carlisle Barracks maintains more than 100 historic buildings, 22 of which are listed in the National Historic Register. The reason High Street is so wide in Carlisle is because a train ran down the entire length of High Street in Carlisle for 99 years. It made its last run in 1937. You can read about it on the wayside marker on the NW corner of W. High Street.